Nikky Finney was born in South Carolina, within listening distance of the sea. A child of activists, she came of age during the civil rights and Black Arts Movements. At Talladega College, nurtured by Hale Woodruff’s Amistad murals, Finney began to understand the powerful synergy between art and history. Finney has authored four books of poetry: Head Off & Split (2011); The World Is Round (2003); Rice (1995); and On Wings Made of Gauze (1985). The John H. Bennett, Jr. 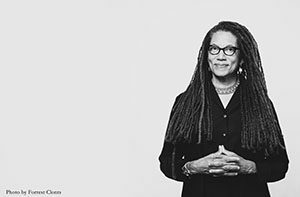 Chair in Creative Writing and Southern Letters at the University of South Carolina, Finney also authored Heartwood (1997), edited The Ringing Ear: Black Poets Lean South (2007), and co- founded the Affrilachian Poets. Finney’s fourth book of poetry, Head Off & Split, was awarded the 2011 National Book Award for poetry. The Bankhead Lectures are endowed by a gift from the esteemed Alabama family whose service to the state and nation spans five generations, who count among its number senators, soldiers, congressmen, a Speaker of the House, one famously outspoken actress, industrialists, lawyers, writers, farmers, reformers, and many UA alumni. To honor the Bankheads’ enduring legacy of commitment to the state’s economic, educational, and cultural advancement, the lecture series brings to campus prominent writers whose lives and work reflect a similar duty to the future, who exemplify the potential of art and personal courage to confront difficult truths and by inspiring the best of human virtues help us reach toward their attainment within ourselves and our society.